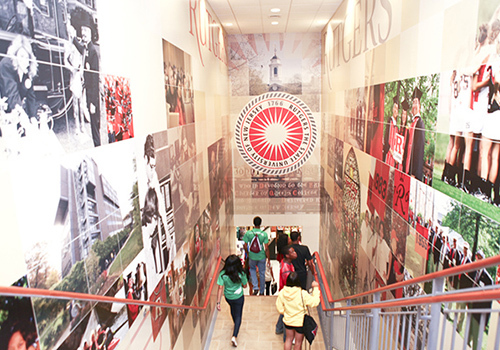 Students descend the mural-covered stairs in the Barnes & Noble at Rutgers University bookstore in New Brunswick, New Jersey. New Jersey’s Rutgers University had been developing fully online courses since 1999, but three years ago they wanted to dramatically expand their offerings, especially in the area of online degree programs, to extend the University’s reach to students far beyond its home state. Undergraduate enrollment in some form of distance learning program has become much more common over the past ten years, but Rutgers wanted to take care in choosing the correct partners for this important next development of their education offerings, and the resources they chose were Pearson and Barnes & Noble College. Both companies were known to Rutgers: Pearson, the largest educational book publisher in the world, was already a key partner in the university’s LMS (Learning Management System), while Barnes & Noble College had a long tradition of managing the campus bookstore. “We had a partnership already in place with Barnes & Noble College for e-books and e-resources, and we wanted this solution built into the Pearson’s LearningStudio, and to make it easier for students and faculty to use these features,” explains Dr. Richard Novak, Vice President of Continuing Studies and Distance Education at Rutgers University. The program was also a great way for the bookstore to expand its services to students and faculty. 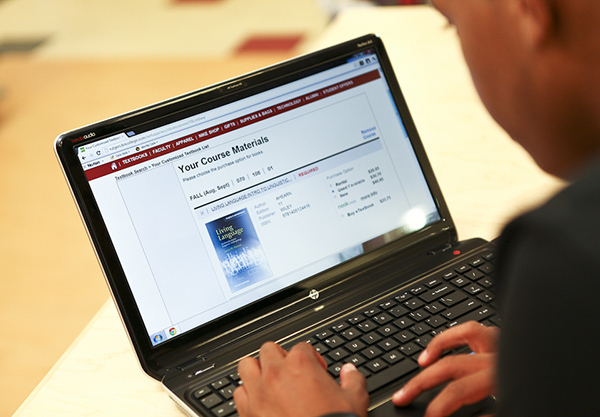 “Working with Rutgers on this project was another effective way to be able to bring our affordable prices to more students, and another opportunity to work with faculty on improved access and convenience,” explains Nicole Guerrieri, Director, Digital Education for Barnes & Noble College. “There was a learning curve for us.” she admits. “This was the first time we had built a solution for the Pearson LearningStudio platform,” and the advantages of the partnership became quickly apparent. An immediate benefit of the project for faculty is that users can access the system with a single sign-on. “With the new integration, faculty can pair their LMS account with their FacultyEnlight or bookstore website account one time — and never have to log in again, so it’s providing time savings and an easier sharing of information.” Guerrieri says. Because of the far-reaching nature of the project, success required the collaboration of different people in both companies, without the benefit of a long lead-in period. “We asked them to move this in a tight timetable — to be ready for the fall semester,” explains Novak. “And they both understood the need, the issues and why this was important to us,” he says. The system went live in time for the following semester and forms part of a program of selected faculty and courses. “We wanted to provide a program for this semester, and take the opportunity to collect feedback from all parties,” Novak says. The plan is to offer the new capability across the platform and make it available to all courses and faculty in the new year. “The online world is where institutions need to be today, it’s the expectation and it’s got to be part of the portfolio,” Novak explains, although he’s unconvinced about digital-only educational models. “The campus isn’t going to go away, neither do I think online solves all problems, but I do think a more difficult proposition for higher education is establishing what it is students want to learn and how they want to learn it. That’s where technology can really open up possibilities for more effective learning,” he adds. While awaiting the results of the program, Dr. Novak says he’s impressed with the way both partners handled the Rutgers project. “With Barnes & Noble College and Pearson, their traditional business has always been in print, but both companies are clearly evolving, clearly realizing the importance and role of their digital assets, and have developed business units that can respond with a commitment to customer service,” he says.